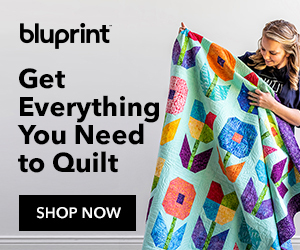 Disclosure: I was asked by Quilter’s Paradise to test out their product. I am not being compensated for this review other than receiving the product without charge. My experience and opinion of their technique are honest and made with the consumer (you) in mind. What is the Slit ‘N Sew Method? Slit ‘N Sew is a technique that makes piecing together challenging units really quick and easy. It entails using specially designed templates for cutting pieces such as clam shells, diamonds, apple core and drunkard’s path blocks. These templates have slits that are used to line up the edges of the fabric pieces as you sew them. If you’re like me, anything with curved edges or odd angles requires a lot of energy and patience. I often avoid such patterns because I don’t want to work that hard to have fun. This technique offers a way of making difficult units come together easily and painlessly. Many of the templates are designed to work with precut fabrics such as 10” layer cakes and 5” charm squares. I found this to be an added bonus and makes the template even more useful for those of us that like working with precuts. 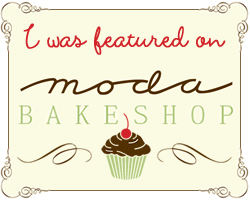 I’m working with a 10” layer cake from Moda – Mixed Bag by Studio M – in brushed cotton (almost like flannel). For this particular shape, the Drunkard’s Path, the slits also help to ease the curved edges together. Once the slits are cut, you can see by stretching the curved edge that it can practically form a straight line. How does the CutRite template work? The templates have slits placed along the seam edges that are designed to align with the corresponding edge. You can cut these slits with a rotary cutter or you can mark them first and then cut them with scissors. I used a rotary cutter, and I’ll discuss size and technique in just a bit. Once your pieces are cut out, you line up the slits as you sew the seam. There’s no need to use pins and it’s quick and easy to stitch the unit together. The templates come with a CutRite HandiGrabber material that you apply to the back of the template. This keeps them from slipping while you cut, and it works really well. Blade size: I tried the 45 mm size rotary cutter and the 28 mm size. I was able to make the 45 mm rotary cutter work, but it wasn’t as easy as the smaller one. When you expose the blade on both of these rotary cutters, you’ll see that the smaller blade has a smaller circumference (obviously) therefore making it easier to fit inside the slit. The 45 mm blade makes a shorter slit, whereas the 28 mm blade creates a deeper slit that is just right. NOTE: The slits should not be deeper than a very scant 1/4”. 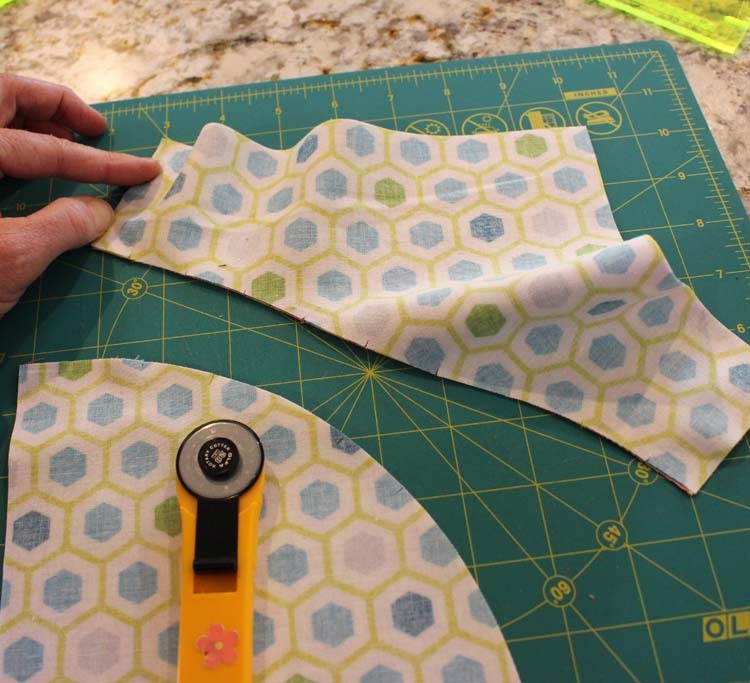 Test out your rotary cutter on a scrap piece of fabric to be sure. Cutting the slits with a rotary cutter was a bit tricky at first. I found that it helped to hold the rotary cutter at a more upright position when cutting the slits. Normally I hold it at a 45 degree angle, but for this, I was holding it at almost 90 degrees or perpendicular to the cutting surface. This made a big difference for me. 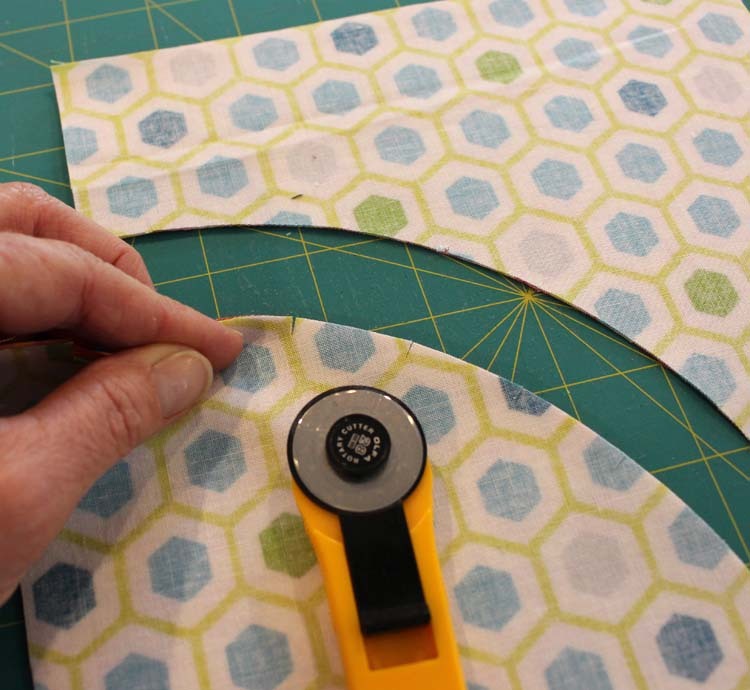 Going around the curves may be easier with a smaller rotary cutter, depending on the exact template you’re using. For this one, the curved edges are fairly large so either size rotary cutter works. One way to “cheat” if you only have a 45 mm rotary cutter is to back up the template 1/16” from the cut edge. This will give you a little more room to cut into the slit. I did not try using a marking tool and scissors to cut the slits, but it seems like another good option to try. 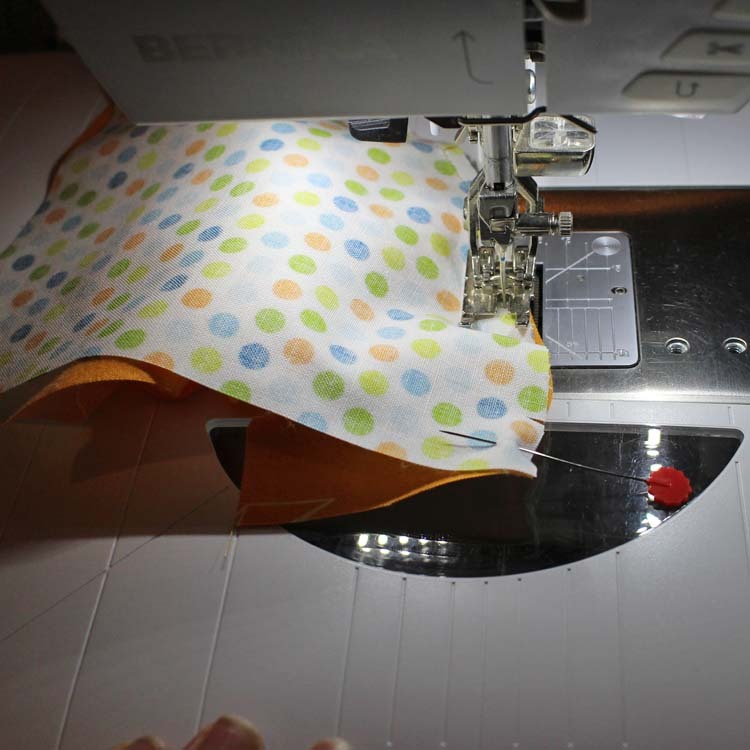 Sewing the seams: I shortened my stitch length to 2.0 to make sewing the curved edge more smooth and secure. I started by matching the beginning raw edges as you normally would. Once I had sewn a few stitches, I lined up the first slits. Once I sewed past the first slit, I lined up the next one and so on. I found that I needed to stretch the top fabric to make it line up with the bottom slit. That’s fine; there is a lot of ease in the curved edge, so don’t worry about stretching it out of shape. Once I got my rhythm down, I was stitching fairly quickly. I didn’t worry about the slits lining up perfectly (once in a while they didn’t). Make sure to line up the edges at the beginning and at the very end of the curved seam. I found that using a pin or stiletto at the end was helpful in keeping that edge together. It might look a little “ruffly” when you’re done, but it will press out just fine. You can press to the light or dark fabric – whichever works best for your pattern construction. What I really loved about using this technique and template was how quickly and easily I could produce the Drunkard’s Path block with accurate results. My particular size makes a 8” finished block. The blocks turned out to be 8 1/2” unfinished with no trimming up needed. That was amazing in itself! There were just a few edges where the curved seams did not line up perfectly at the end of the seam but it didn’t affect my blocks fitting together. I made this cute baby quilt using 36 eight-inch squares. There are so many different setting options for this block. I played around a bit and came up with this one. It’s a little unique, but I like it! Note: This giveaway is now closed. The nice folks at Quilter’s Paradise have generously offered to give away a CutRite template of your choice to one lucky blog reader! All you have to do is leave a comment on this blog post (not my home page) telling me your favorite quilt block OR your least favorite quilt block. This giveaway is open to all, US and international readers. You have until Friday, February 15, 2019 (closed) to leave a comment to enter. The winner will be selected at random and can choose any CutRite Slit ‘N Sew template from Quilter’s Paradise! Due to the high volume of comments during giveaways, I’m unable to respond to each one. I do read and appreciate every one of them. If you have a specific question, I will see it and respond as needed. To enter, leave a comment telling me your favorite or least favorite quilt block to make. I hope this information was helpful. I know there are always new products on the market, and it’s hard to discern which ones are worth the investment. I was pleasantly surprised that these templates did what they were designed to do – make a challenging quilt block easier and faster to construct. These look like great templates to make sure that the seams line up correctly. Much quicker than folding to create lines like I do. I want to try a Dresden plate quilt. My favorite pattern so far has been the rhombus star. 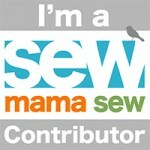 I just found your blog and I LOVE it!! I haven’t liked the Drunkard’s Path, but hadn’t thought of the new variations possible with an easier way to sew them together. 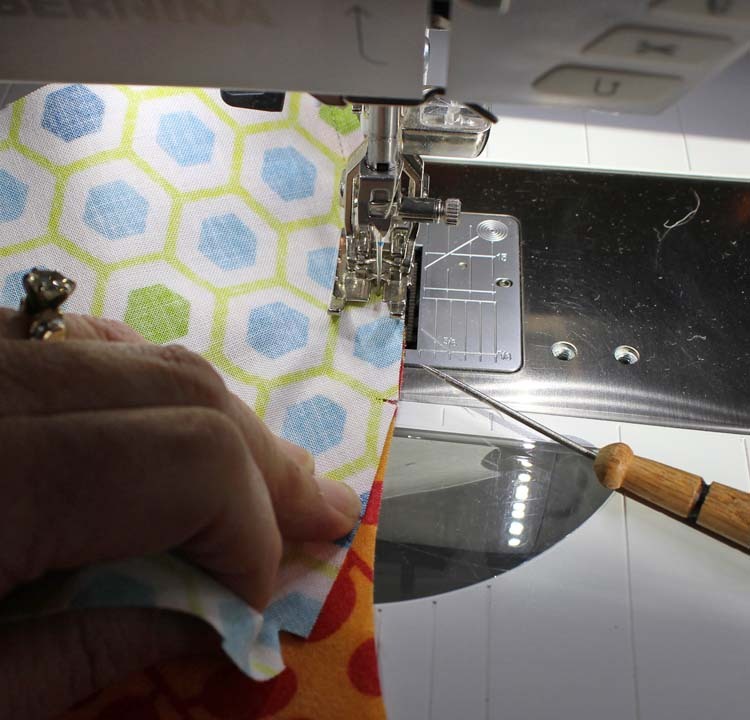 Looks like another great tool to make some fabulous quilts! I have the most trouble with double wedding ring. BUT it’s my favorite . The disappearing nine patch is one of my favorites because it works up so fast and is so versatile. Just came across your drunkards path slit&sew info.Love this pattern,but it takes so much time pinning.I’m making a quilt for a wedding gift for my sweet grand-daughter&wanted to use this pattern for the boarder.Love your page!The best helpful info!Thanks so much!! !Jeanie Thorpe. Looks like a awesome set. Struggling with Y seam in Lone star block. Your blocks came out so perfect. It’s a beautiful baby quilt. I would say double wedding ring blocks are my most intimidating blocks to make. I like all types of star quilts! Thank you for sharing your review. I’ve been quilting for a very long time and have created many different blocks but my all-time favorite block will always be the pineapple log cabin. That is a well written review and your quilt is quite pretty. I don’t have a favourite or dreaded quilt block. Mind you, at the moment, I am in my applique zone. Once I get back to pieced blocks a dreaded block will likely remind me how much I dislike it. 🙂 Thanks for the chance to win. My favorite is any star, and I really struggle with the roof on house blocks. I think there is a ruler for that too! I’m not a basket person at all, love all kinds of stars. I love the drunker path but I do not like blocks with curves. I love star blocks but will never do another lone star again! This Slit N Sew makes it look so easy to make a Drunkard’s Path block. Thanks for showing us how it works Julie. Drunkards path is always looking so pretty and at the same time intimidating to me. I would love the tool to get good at it. I still haven’t tried any curved piecing, it’s my fear!! 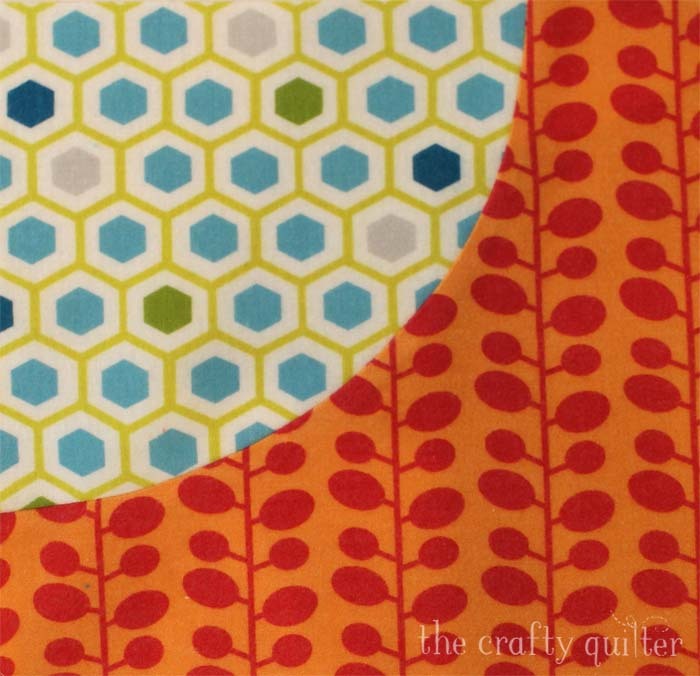 All the recent quilt patterns I’ve loved lately have curves….. I love the log cabin. So many variations. I have made several scappy ones. Thanks for the generous giveaway. Love your blog. Oh Julie, this is so cute! I would love to try this out! My favorite quilt blocks are stars ✨ and houses least favorite might include ones with a Y seam…. Now that’s a nifty idea! I’ve always wanted to do a clamshell, but oh! the curves! I’m still fascinated with half-square triangles because they are SO versatile. I love flying geese, but I am especially drawn to curves. I haven’t sewn anything with curves because they intimidate me. Maybe these templates will change that! I like log cabin blocks. Your review of this tool was very good. My favourite block is anything with a four or nine patch in it. My favorite block is the star block with an Irish chain included. My least favorite is the double Irish chain. I like Star blocks. Those made with Tri-Recs are especially attractive. I’m working on a double wedding ring and it is very slow going because I really want the points to match. Not my favorite block right now because it feels more like work, rather than fun! My least favorite block is one with Y seams. I love triangles but am ready to try a curve! I feel if I win this template the Drunkad’s Path might become my new favorite block! I love the way you set the block! Fun and happy! My least favorite quilt block is the Drunkard’s Path. So the new rulers might make it my most favorite block! Very nice instructions on this tool! This is on my bucket list to make. I have never sewn anything with curves, this looks like Magic! I love the baby quilt, and have just the gal to sew one for. I haven’t had aot of success with curves. The slit and sew is a great idea! I have avoided doing the drunkards path block because I thought it looked too hard. But with these templates I think I would enjoy making a quilt with them. I love the children’s quilt you made using the template. Would love to try this. Any star block is my favorite. I have been wanting to do a drunkard’s path for some time so this may be the ruler I need to get me started. I love to make churn dash block, and log cabins drive me crazy!! Would love to win as that might be the answer to my trouble with curves!!! I really enjoy making the flying geese block, it can be used so many ways! Right now I am making stars with it. I was not really into curvy piecing until recently, not I’m enjoying it! I can see how these templates would speed up the process while keeping the block accurate. Your baby quilt is adorable! My favorite blocks are log cabin and pinwheels. I dislike anything with curves, but see how these template would definitely help! The pinwheel block is my favorite. I enjoy trying the many variations you can create with this design. I love flying geese. They are so useful and versatile and can be constructed so many different ways. I particularly like playing with color and size with them. It’s so funny that you posted about the Drunkard’s Path because I remember emailing you a few years back after seeing a quilt on a magazine cover and wondering what the block was. You kindly replied and let me know it was…the Drunkard’s Path! The templates look great! My favorite block is the Dresden Plate. I’ve been wanting to make a drunkard’s Path, but was a little intimidated by the curve, but this template makes it look easy. Love drunkards path. This ruler looks like it would make the block much easier. Thanks for letting me know about it. 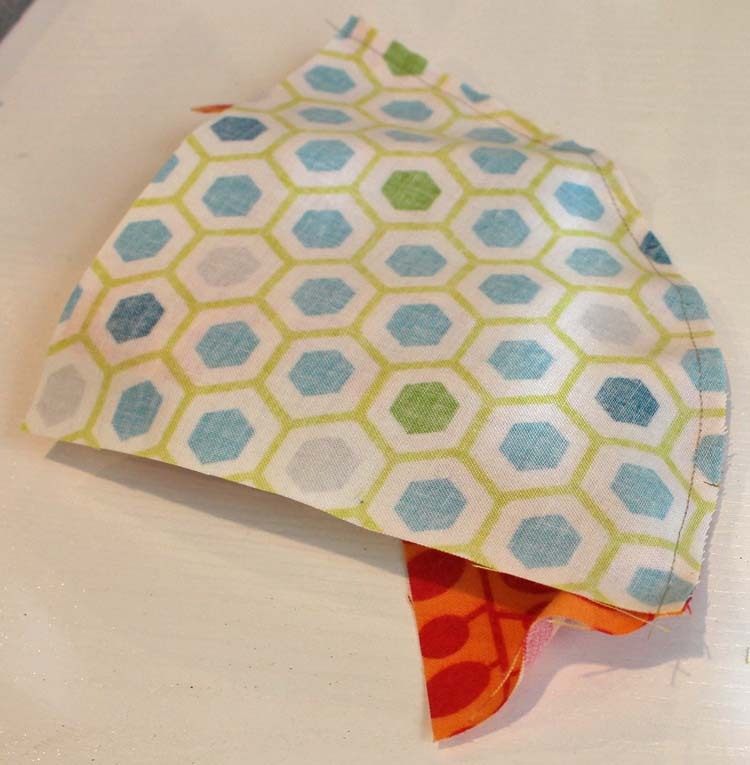 Love the baby quilt you made with the cut rite tool ! Nice choice of colors ! I love the look of scrap quilts & blocks that work with scraps. Log Cabin and star blocks are favorites. Forgot to mention the bull’s eye quilt is a fun sew along currently offered by Country Threads. I think this Cut Rite Template would be very helpful in the current quilt i am making a bull’s eye quilt. The fun feature of making one of these quilts is that you don’t use anything to cut the curve making a more relaxed quilt. But if you have to have perfect circles than i think this template would totally help! Thanks for a chance to win. My favorite block is the log cabin. This was my very first block. I love this blog post. I am working on the Drunkard’s Path now and this template would be so helpful. My favorite block is log cabin. They are simple to construct, and endless layout possibilities. I like making star blocks using the no waste flying geese method. If I had to choose just one, it’s the New York Beauty block. But honestly, whatever block is in the project I’m working on is my momentary favorite. My current favorite quilt block is the 4-patch posey , or stacked four patch. My favorite changes all the time! I love most blocks and never make the same thing twice! I’m an eclectic quilter. Thank you for the opportunity to win! Would love to play with a new template! I actually have three favorite quilt blocks, and one of them is Drunkard’s Path. I am finishing up a quilt now and then going to start a Drunkard’s Path table runner for my daughter-in-law. Having a template like this would make for easy work! I love the Bears Paw block. I really like most star blocks too. My least favorite block to make is any block with y seams. That tool looks interesting. I don’t think I really have a favorite block. I enjoy making flying geese and everything half square triangles. I hadn’t tried and curved seams until I made a double wedding ring quilt so I am more confident about curves now as well! The idea of these templates is awesome. I really don’t like to make curved blocks in the traditional way because I hate to pin, but these take pinning out of the equation. Thanks! Your baby quilt is beautiful! I love any block with curves, especially the drunkards path because it is so versatible. Thanks for this giveaway and for all the inspiration that you provide. My least favorite block is the dresden plate. Have tried and tried, but they never seem to lay flat. Thanks for this helpful review. I have made drunkard path blocks before and didn’t find it THAT difficult but time consuming with all the pinning. So this new tool really looks helpful. My least favourite is the apple core although I have already hoarded a lot of fabric for an apple core quilt that I may do one day… 🙂 . What I love most are star and house blocks I think. Y seams are time consuming but sometimes necessary. This looks like a great tool, Julie! I live your bright quilt!! My favorite block is a Swoon Block ! I absolutely love your quilt here on this post. I would love to make one as beautiful as yours. My favorite would be the hst because you can do so much with it and I’m still a newbie so I haven’t tried a lot of the harder ones. Good luck to everyone! My favorite quilt block is the disappearing nine patch block. It looks like you did something difficult but it’s a easy block. My favorite block is a Granny Square. Would love to try these. Least favorite Winding Ways, it’s a hard one. My favorite block is ANY star block. Drunkards Path has a special place in my heart and is dear to me. My late husband’s grandmother made us a beautiful navy and turquoise king-size quilt for us – love the block! I love the look of the drundards path, and there are so many variations. So far I’ve been too nervous to try it, but tese templates look like a great way to get started. The Slit ‘N Sew tool is very clever. I don’t have one of those, but I do have a special presser foot for sewing curves. I haven’t used it yet so I don’t know well it works. I’m gonna have to try it soon! Your baby quilt is delightful and it should be unique! That’s part of what makes it so good; it’s uniquely yours and the colors are catchy – perfect for a baby quilt. My favorite patterns are log cabins are rails. Feathered Star is my favorite block! The log cabin block is my favorite, because it can be easily arranged to make many different patterns. I love log cabin and pineapple blocks. Would love to win a template! I love a drunkards path block but my blocks are never consistent when done . This looks like a solution! I love pineapple blocks! Curved piecing is definitely not in my comfort zone… maybe with this template? The feathered star is currently my least favorite block. Your baby quilt is cute! We have a shop hop going on right now. Surprised Jodi yesterday! Love the Dp that you made—Colors and arrangement are fabulous! I like to make most all blocks, but unusual one s are my favorite! My least favorite quilt block to make is anything with curves!! So I’m really hoping this method will work for me & I would love to try it!! I don’t have a favorite since I am fairly new. I can tell you I tried to stay away from Drunkard’s Path and circles since they looked so hard to make. I think this might be a good tool to try and I think I might like to try circles. Your baby quit is adorable-I love it. Any block with a curve would be my least favorite. 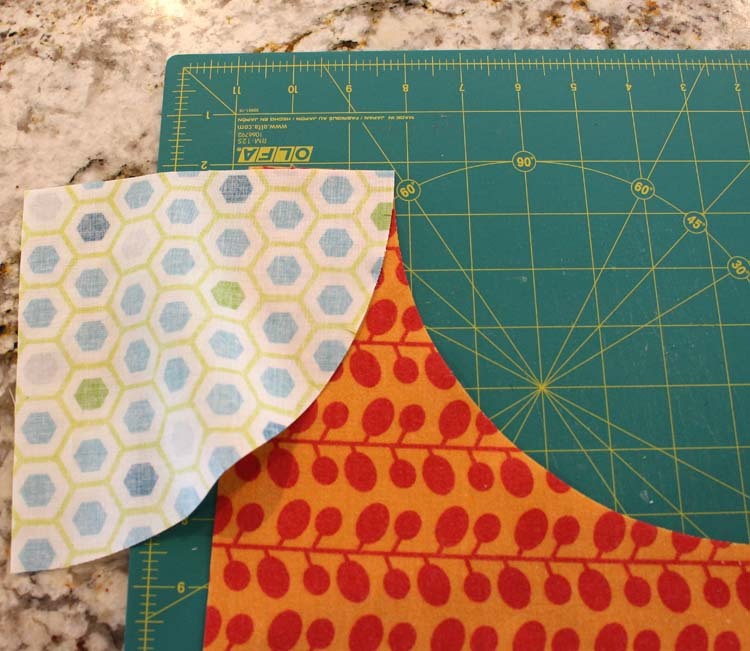 But these templates look like they would make the curved edges much easier to sew together. Reminds me of sewing sleeves into a garment and matching notches and points. My least favorite block has been the Drunkard’s Path, but your review of this template makes me want to give it another try. Sewing curves is not my favorite thing to do so I stay away from them. I may look for this template next time I’m al a quilt store it looks interesting with the slits. Thank you for the tutorial, very informative. It’s nice when someone else does the testing for you. I like the look of the Quick Curve ruler. I don’t think I have a least favorite or for that matter favorite block (haven’t tried them all though), but these look like the templates would make it easier to make a lot of fancy blocks! I’ve been wanting to try a clamshell for a long time! Maybe this will get me to do it . Love the review Julie! 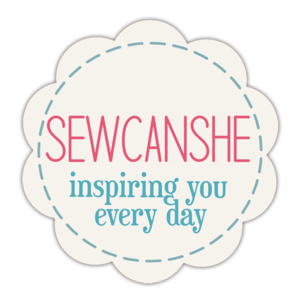 Love apple core – don’t like sewing apple core! I like any feathered star. I’ve not tried much curved piecing but this product looks like it would take all of the pain out of the curved piecing process. Thanks for the offer! Oh my, I would love to win the Slit N Sew Drunkard’s Path temp,ate set. Just this week I’ve tried a Drunkard’s Path for the first time. I think it qualifies as my least favorite, but it looks like this template would help. My favorite blocks are hexi’s. My favorite block is an Ohio Star. I love all kinds of blocks… except applique. Anything with curves or a lot of triangles are my least favorite, but this new template should helps itch the curves! I love Drunkard’s Path and I am glad to see a new tool to make it easier! My favorite block is the log cabin, least favorite block anything appliqué. This looks like a great way to make a complicated block an easier way. 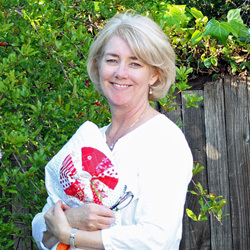 Thank you for the generous giveaway, I’m off to the Quilters Paradise website to check it all out. I love any type of star block… and log cabin 🙂 I could not just choose one! tks! Friendship Star is my favorite! My least favorite block is the Snail’s Tail and after seeing this neat new template the Drunkard’s Path is definitely a favorite I would like to try. Wow! You made that look easy! This is my least favourite block as I can never get it right. These tools look like the answer to a lot of peoples problems with the Drunkards Path. Perfect for the person who wins them. My favorite block is the log cabin and my least favorite is the basket block. I love the orange peel blocks, but have always been too intimidated by all the curves to try one. Maybe with this technique I can finally make one! Julie, I don’t have a favorite block. My least favorite is still anything with curved pieces, like those you mentioned in this post. I would once have said that anything with applique, that’s paper pieced, or contains a Y-seam is on my least favorite list but with the right techniques, I’ve found that those are all workable with a little practice. I know that is also true with curved seams but this may be the technique that would make all the difference. If only it was more flexible than a single size per template pair. Any block with Y seams is not my friend! Drunkards Path runs a close second But as long as I can square it up, I’m happy. Also, I agree with one of the commenters about the ways the seams get ironed in multiple piece blocks! Can be very frustrating! That said, I love a challenge!!!! My favorite block is a log cabin. There are so many variations. I love the idea of this template! Nice instructions thank you. My favorite is definitely Drunkard’s Path! I’m not a block lover. Mainly because my blocks never end up the size they need to be. Even when I use a scant quarter inch. So any template that will help me love blocks more would be super-awesome! This looks great! I’ve been wanting to sew curved seams but have avoided them because they just appear to be too much work therefore my least favourite type of block. I’ve always enjoyed blocks made from the half-square triangles! Thanks for offering the chance to win! I am an experienced beginner so my favorite block would be the windmill. Not very good at the drunkards path. This new template would be a great help in overcoming my fear of the curved blocked. I’m a beginner so am still learning. I have been enjoying English Paper Piecing. I love the Dresden Plate! 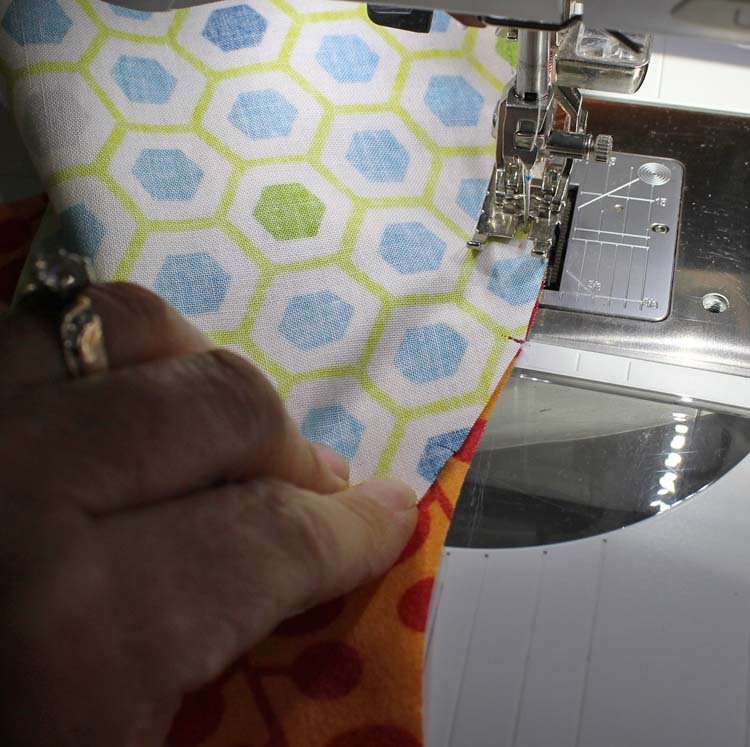 Your tut and the design and colors in your baby quilt are GREAT! You inspire me! I love making log cabin blocks. My least favorite is the apple core. I really love the New York Beauty block! It can be a challenge at first but the results are so worth the time put in. I’m not a big fan of pinwheels or anything involving paper piecing. It just stresses me out. I can see how this template would be very helpful with curved piecing though. BTW, that baby quilt is fabulous. May have to steal that idea!!! My least favorite block to sew is Birds in the Air or it may refer to swallows. I had to make this block twice for two friends and it was time consuming and a bit frustrating. I’d love to win the templates to try. My least favorite block is one with y-seams, but if all goes well, I am so proud of myself for tackling it. When it doesn’t go well……. I like the floating churn dash block. Hello Julie, I thoroughly enjoyed reading your thoughts on using this set of templates for the Drunkards Path. It seemed to me that, the template did make it easier and what an awesome quilt you made while testing it out for us! I always have such a difficult time answering the question…but my favorite block to make is the Double Irish Chain. It is so much easier to answer. Thank you for sharing and have a fabulous day! I would have said drunkard’s path is my least favorite; now I’m not so sure. I love the drunkards path pattern featured on this blog!!! I would love to make it. My hardest pattern was a log cabin that had wonky seam allowances. I think I should have saved it for when I had more experience. My Granddaughter loved it anyways!!!! Thanks for the info. Oooh! I love these CutRite Slit & Sew Templates! I so admire the variety of layouts possible with Drunkard’s Path blocks and have made a few individual blocks. I think these templates would give me the extra edge needed to make a whole Drunkard’s Path quilt! The Melon template set is pretty awesome too. As far as a favorite block is concerned, I LOVE star blocks! I still am challenged to make even Flying Geese blocks though. I love this cute little baby quilt. I choose circle blocks for my favorite. Y seams my least favorite!! I don’t enjoy making blocks with curves, although I have done them before. Curves are just so slow for me! This template might help with the fussiness of sewing curves! I tried to make a double wedding ring quilt and it was a total failure so, if I make a drunkards path quilt, it will have to be made with fusible appliques. I would so like to make one using this method. Where can this tool be purchased? My favorite quilt block to make is a friendship star. I do not care for Sun Bonnet Sue. I hate making the drunkard path. My favorite block is the 54-40 or Fight star block, it had endless possibilities for me! Least favorite I have tried is Dutcman’s Breeches! My least favorite blocks are anything with curves! I’ve never tried them because I’m so intimidated by them… I enjoy EPP because it’s so easy to get the accuracy I love. My least favourite block to make is the drunkard’s path. I started a block of the month club to make a quilt that turned out to be completely made of drunkard’s path blocks and guess what? Yes, you guessed right, it’s still waiting to be finished. This new tool would be a godsend so I could finish this quilt. I love the color’s in it but… Thanks for the chance to win it. While I love the look of the double wedding ring, it is a challenge to piece and to put the blocks together. The log cabin block is my favorite, but I would love to attempt more challenging piecework. I like all blocks except for the ones with many pieces in them. I like the cathedral block! Have never done a drunkards path before, so guess it’s my least favorite. Want to do a Quilt of Valor one using this pattern tho. GREAT baby quilt top! Am amazed at your creativity. I would have to say that my least favorite blocks are ones with curves. So, these templates would be a great help! My least favorite is the apple core. If I have the cut and slit template, that will sure make it easier. I love and hate HSTs. They are easy to make but I usually need so many I’m sick of them in no time. Nice tool! These rulers look amazing! Thanks for sharing them. My favorite quilt block is carpenter square. I love any star block. Any block with circles is my favorite. I love coming up with new ideas to use circles. Have been afraid to try any curved block, but reading this has made me think I should give it a try. Love doing flying geese. Although I love the look of the Hunter Star, it is my least favorite block to work with. I really like Drunkards Path blocks, but find the curves intimidating. I also like any pieced block that becomes a cat. My least favourite block is anything with over 16 pieces or, pieces that end up as 1″ squares. I love blocks that look great with pieces no smaller than 2″ finished. Bigger is better! I like star blocks. I made one Drunkards Path, with this template I would easily make another one. I really like the log cabin block. Blocks with curves have scared me away, but this template could change that. Your quilt is beautiful! This looks interesting. I have avoided Drunkard’s Path patterns but this looks helpful. I dislike most house blocks, stars with four points, and anything “spikey”. Your tutorial is very good and I would very much love to give it a whirl (no pun intended). I’ve always loved Drunkards Path, but was never willing to try it before. I’d love to win!!! My favorite block has always been the Grandmother’s Fan….with this new tool….I think it will change to the Drunkard’s Path!!! My least favorite block was a 60 degree triangle log cabin. A disaster.! I love log cabin block. It is easy to make and there are so many ways to lay out the blocks. I love stars too! I’ve made your Franklin star, vintage stars…all stars! Still challenged to get the points just perfect sometimes! I have a “love/hate” relationship with flying geese blocks! This template is so incredibly helpful. 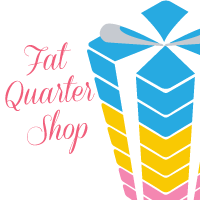 Before they closed their shop, Quilter’s Paradise was one of my favorite places to shop in San Diego … We really missed them when we were living in Vista. I have some of their rulers and highly recommend them …My favorite block is all of them. LOL I have a special place in my heart for the pinwheel. So many different blocks to make from that one. Happy to know Quilter’s Paradise is out there and you are supporting them, Julie!! My favorite block is the Log Cabin. Any block with curved piecing has always intimidated me because I have a hard enough time with straight seams! Let’s just say my piecing skills leave a lot to be desired. Drunkard’s Path-tried that- not so good. So I thought, okay it’s “drunkard’s” path, them maybe a little wine will help with the curve!?! But sot so much, so I just decided that quilt was not in the cards for me. However, your post today gives me new hope. 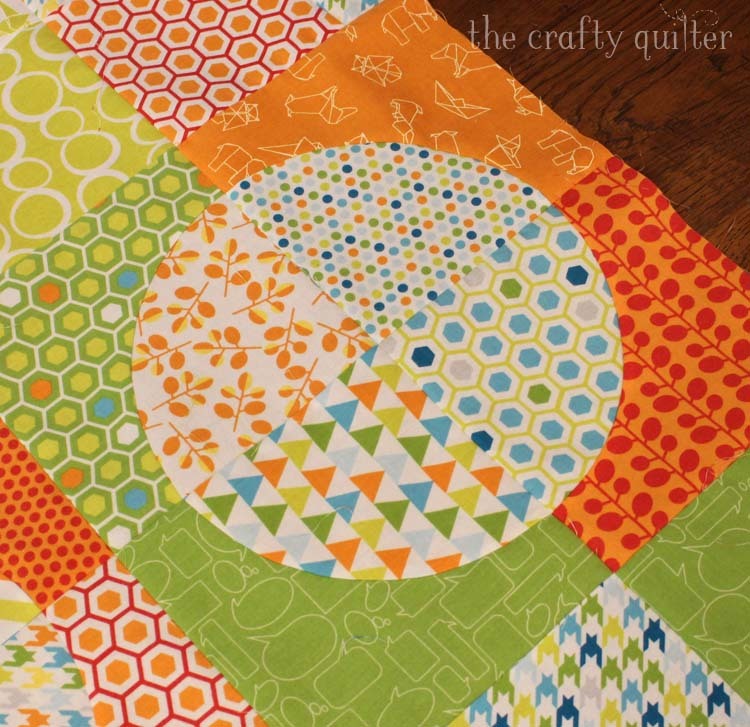 I absolutely love your quilt you made using the new CutRite Drunkards Path Template; it is beautiful! I would love to make a similar quilt for my great grandchild due this summer. Who knows if I win this template I might be able to conquer my fear of curves! Thanks for your review. I love a log cabin block, and find Grandmother’s garden not a favorite. Thanks for your great demonstration. My favorite pattern right now is the Sawtooth Star. Getting the flying geese to fly with the middle square in unison though is my challenge. The new ruler which allows for slits to match up curvy pieces is pretty neat. Someone should do the same for the geese. There are several specialty rulers for the flying geese unit. Check Deb Tucker’s (Studio 180) Wing Clipper or Eleanor Burns’ (Quilt in a Day) template set, or even the many Bloc_Loc rulers. (Wing Clippers are the most flexible, size-wise.) They all require trimming which is a little extra work but trimming does result in perfectly-sized units -plus- the first two options create four units at a time. I enjoy making the Drunkard’s Path block! I love paper piecing but with them come the curved stitching the circles together. This makes for unique looking quilts so I suppose my favorite would be anything with curves. I love the winding ways quilt blocks. Makes a really cute quilt. Y seam blocks I hate making. 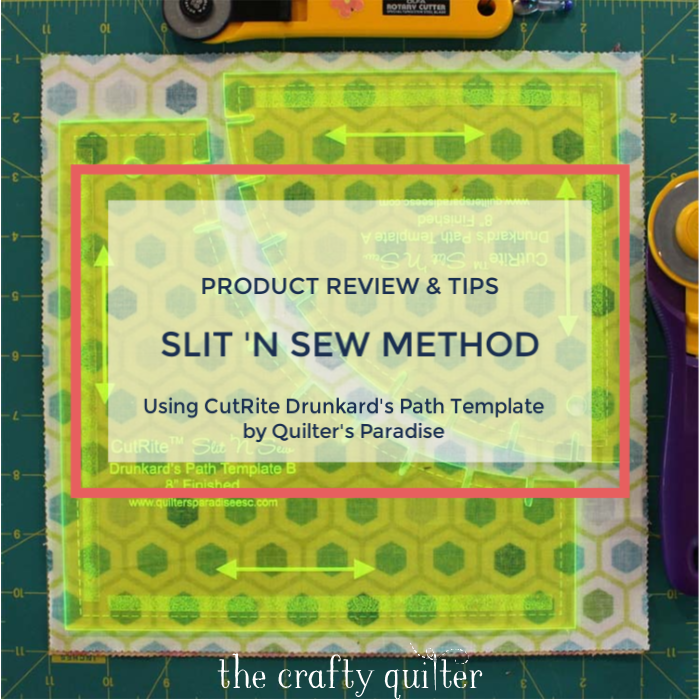 Love this template and how easy it makes sewing the Drunkard. I love the look of curves, but hesitate to make them! Great explanation! I love rail fence projects. I especially enjoy “building” them with charm packs. I love watching how the colors/prints come together. I enjoy making pinwheel and star blocks. Would love a chance to try the templates! Thank you. A cute baby’s quilt. I love piecing but stay away from Y seams. Never attempted Drunkards Path although I do admire it. Would love to try the rulers. My favorite block is any type of star. My least favorite blocks are those that have poor instructions or wrong measurements. That happened to me with a spool block that used y seams and was for me a disaster. I love the look of you quilt, and the rulers seem to make good sense. I like Log Cabin quilts when making special quilts for family members- marriages, etc. My favorite block is probably a friendship stars, they play nicely with many other blocks. Slit n Sew, what a great idea. You explained the use of it wonderfully. Thanks for the tips. Drunkard’s Path is my all time favorite block. As you said it usually takes quite a bit of time to do. With this new ruler it would be amazing fast. I’ve avoided piecing the curves of Drunkard’s path using applique techniques instead – oh how I would love to try these templates are appealing to me – must buy! Thank you for the review. I love piecing, not appliqué, that being said, I do avoid curves. This tool looks like it would be a nice addition for those times when you “need” to add curves to the mix. Julie – thank you for a clear and concise report on the rulers. My least favorite blocks are those involving curves and this new tool would solve that problem. The slits are a nice addition to my already favorite block, I like anything Drunkard’s Path related. Thanks for sharing this technique. I avoid this very block but this is an interesting approach. I would definitely try using this template. I love star blocks. I steer away from curves and Y seams. I love your baby quilt! I’ve always wanted to do a double wedding ring quilt but it just seems too hard. Now I want to duplicate your drunkards path baby quilt. As always, I love your choice of fabrics. Thanks for the review of this new(to me) product. It looks really easy to use with great results. I love the Celtic Knot block and have made two quilts with it! My favorite block to make is Dresden Plate. Your quilt is so pretty. I have avoided doing curves because when i did do them, they came out all bunched and it was way too much work to try and get it nice. But this ruler sounds wonderful. I would like to try again. Thanks. I am excited to try these new templates, I love the many settings you can do with the drunkards path. My favorite block is the log cabin block! Thanks for the chance to win! I love the versatility of the drunkards path blocks, but have never had the nerve to try them! My least favorite block to make has always been the Drunkards Path block but I love how it looks finished. I think this template would make this a much more enjoyable and doable block!! I’ve done very little curves piecing. These look like something that would make things easier and more accurate. I love log cabin blocks when I just want to sew, sew, sew. 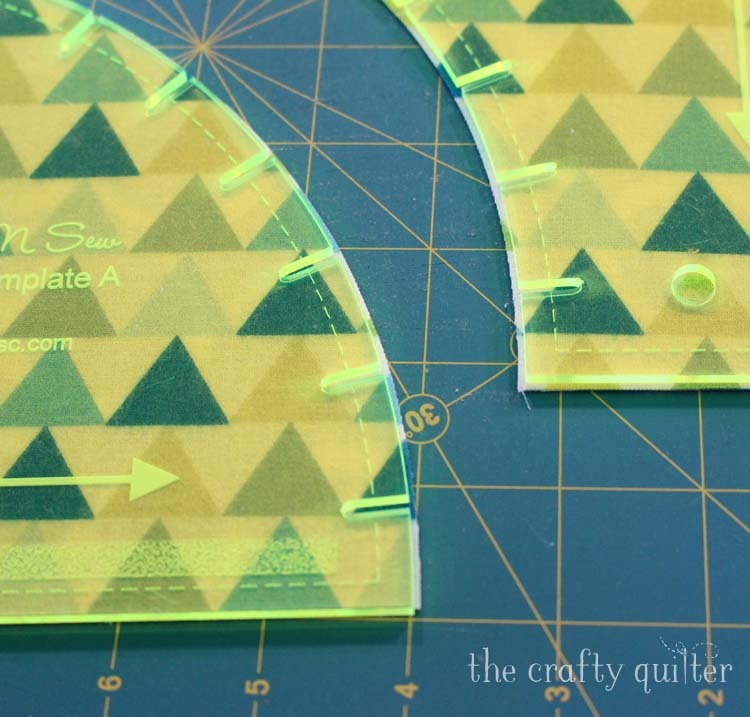 I love the idea of this template with the notches to help with curve sewing. Brilliant! I love the Dresden Plate blocks. My favorite blocks are New York Beauties, but I’ve only paper pieced a few. I recently pieced a melon quilt and a drunkards path in the hope that I would feel confident enough piecing curves to tackle a New York Beaity or a Pickle Dish Quilt. It would appear that using these CutRite slit and Sew tool would help with the piecing of the arcs. I very much like the star within a star block. I have made the drunkard’s path block in the past but it took a lot of time and patience, worth it though. My favorite quilt block is the log cabin. It is the first block I ever made and I love all the different manifestations of the block. I love a basic 9 square block. Thanks so much for sharing. This looks like an amazing tool. My favorite block is the Dresden Plate. The cathedral window is my favorite block. My very favorite block(s) are any of the design appliques for Baltimore Album quilts. I really enjoy hand work. I love the NewYork Beauty block! This template looks awesome and makes me want to try this block. I have so many patterns to use with this. Great tutorial! My least favorite block is anything with Y seams! Right now my favorite block is anything with HSTs or anything on my bucket list (mariner’s compass, storm at sea, hunter’s star…you get the idea). 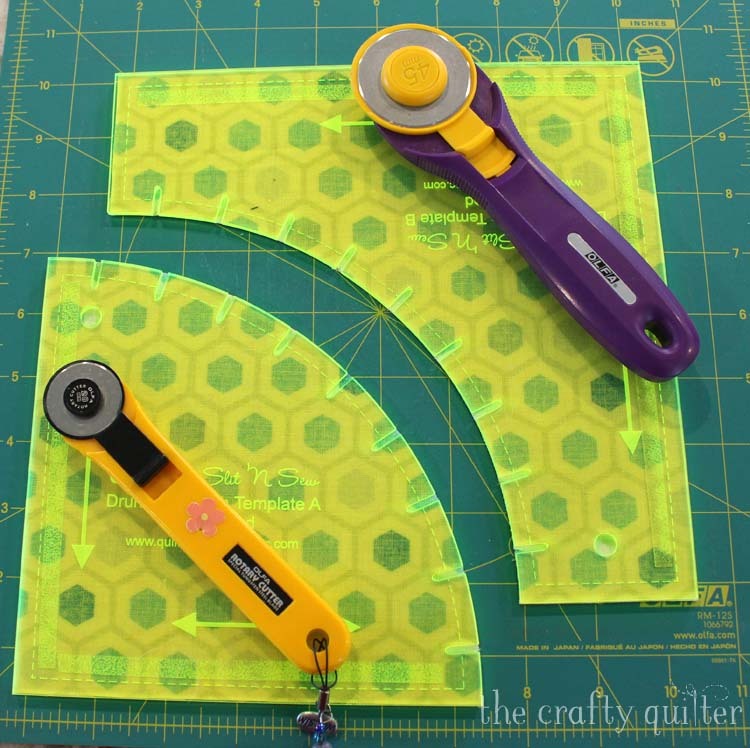 I want to do more curve piecing and this post of yours has been VERY helpful. Great template! I am still learning and trying different blocks, so honestly, my favorite is what I am currently doing, which is churn dash and tumblers—for two different quilts. 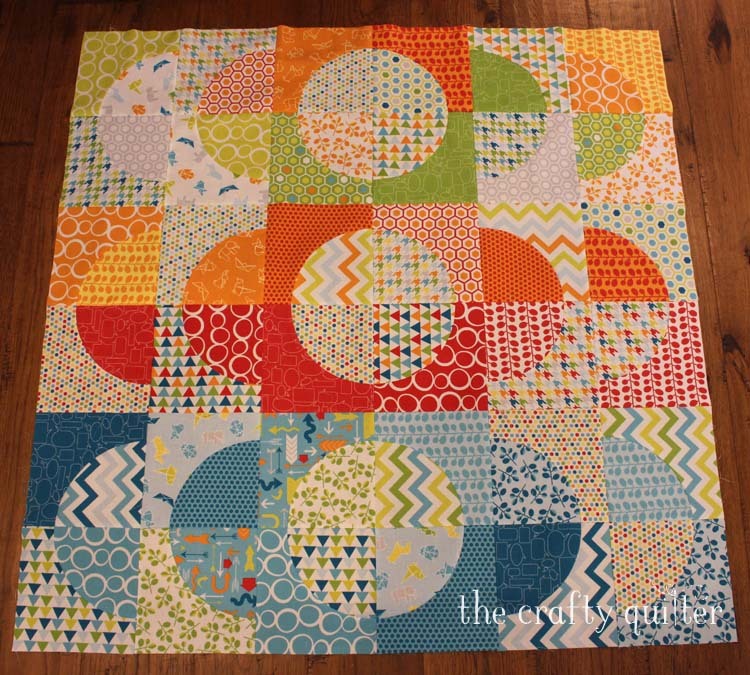 My favorite block is any setting of the good ol’ bear paw…but after seeing this spectacular drunkard’s path baby quilt, I may have to change my mind! 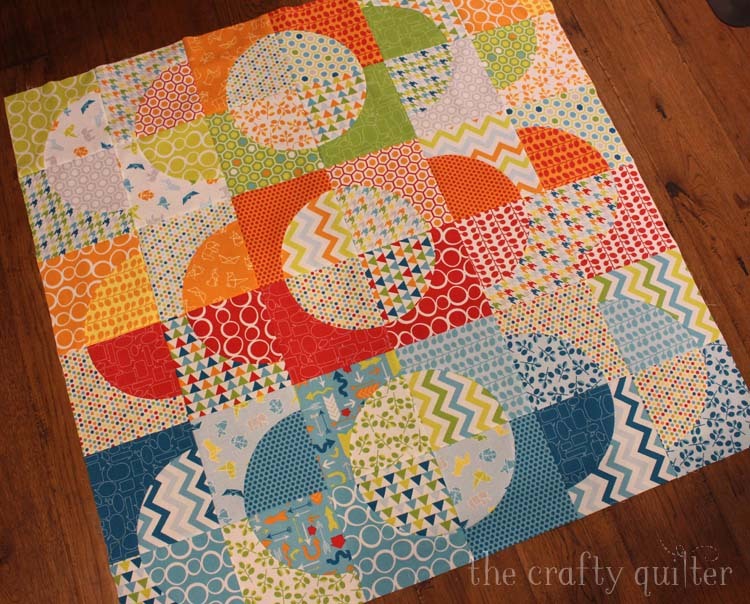 I love the Drunkard’s Path quilt block! Thanks for testing out a new tool. Great feedback! Drunkards Path is my least favorite. These templates might change that! I absolutely love the Missouri Star quilt block. I’m attracted to star patterns and this one has great lines. Being from Missouri is a plus! I love the drunkard’s Path, but using these templates would help a lot. Love making half square triangles! This ruler looks awesome. Great tutorial. I have a New York Beauty quilt that’s been bouncing between WIP and UFO status for quite a while. I love the look of the blocks, but they are soooo putzy to make! I’ve been using glue stick to hold the curved seam while I sew, but it can be a bit messy sometimes. I like the idea of notching the fabrics to line them up! You’ve written the instructions very well. I feel like I could do this! My favorite block is the Bear Claw! Thanks for the chance to win. I love the drunkards path block as you can make so many different quilts using it. Great demo, Julie. I’m always interested in what is new and worthwhile in our quilting world. My favorite block is any star block. Thank you. My favorite block would be the pineapple but now after seeing this method for the Drunkards Path this could become my favorite! I like all star blocks. Your templates look very interesting and I would like to try them out. Thanks for the giveaway! I can see this new template would really help particularly with drunkards path pattern. My favorite pattern is the log cabin because its so versatile depending on your layout of blocks. 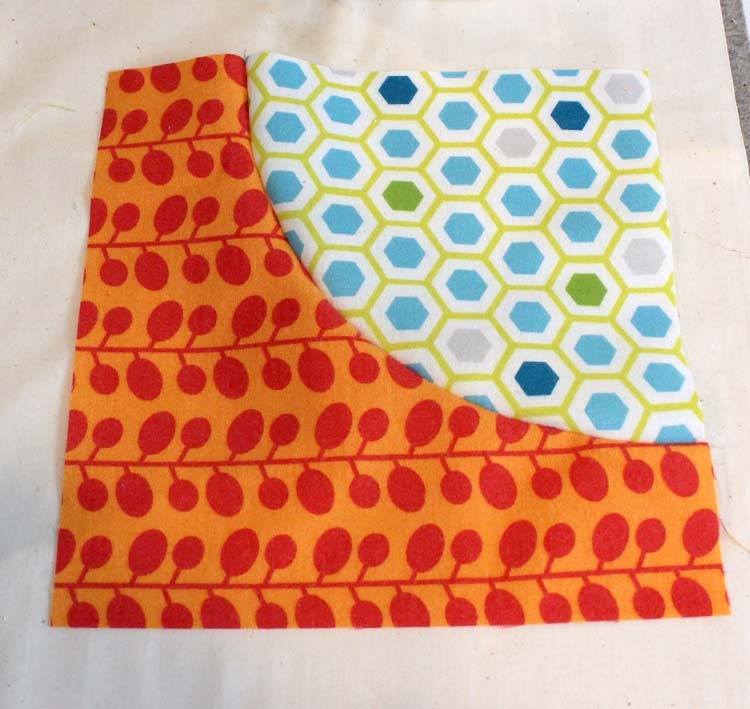 My favorite quilt block is a Snail’s Trail, least favorite, Y seams…. love this template!! My favorite big block is the feathered star, which I’m sure technically is more than one block but I love it anyway. Geometric blocks are the norm but i would love to try a drunkards path! I made a table runner with Drunkard’s Path blocks & it was slow! I’ve actually been looking for acrylic templates to make the job faster, so these might be just what I need! I love all the variations you can make with this block. I’ve been afraid to try anything curved, but this really gives me the courage to give it a go! Thank you so much for your review, it was clear and concise! My favorite block is Baskets. I’m fairly new to quilting, enjoy using jelly rolls. Favorite block in my limited experience is X and O. The curves with slots reminds me of marks used when sewing sleeves to clothes. Nice challenge for the future. What a great tool! Makes me want to try it and I love your fabrics. That baby is going to see a lot of pattern. My least favourite block is the basket, other than that I love many, many blocks! My least favorite block is one where many seams come together and you have to figure out which way to press and if you should press seams open or closed. Working on one like that; 3/4 of blocks are done one way and the remaining 1/4 are done the opposite. I love the Drunkard’s Path block and the secondary circles it produces in a top. Depending on the fabrics used, it can be so fun to see it come together. Anything to help with the curves would be welcome. Thanks for the review! My favorite quilt blocks are star blocks especially ones that come together and make a secondary pattern. Love Friendship Stars, Hate Flying Geese!! I love your baby quilt! My favorite block is the nine patch. After seeing your quilt I believe I am ready to try a drunkads path! I actually love challenging curved blocks. This sounds like a cool way to do it without pinning! My favorite quilt block is the Double Wedding Ring , I love any quilt with these blocks. But that being said it is my least favorite block to make. Alter seeing your quilt with circles, I think that is my new favorite block to make! Probably my least favorite is any block with y-seams. I love the Hunter’s star just made one for my daughter.